There are so many 4th of July celebrations and firework shows in Asheville and in the Western North Carolina mountains! Check out some of the fun below - thanks to www.romanticasheville.com for creating such a great list! There are many 4th of July celebrations and firework shows in Asheville and many small towns in the western North Carolina mountains! Below is a big list of 2017 events and festivals - more than 30! 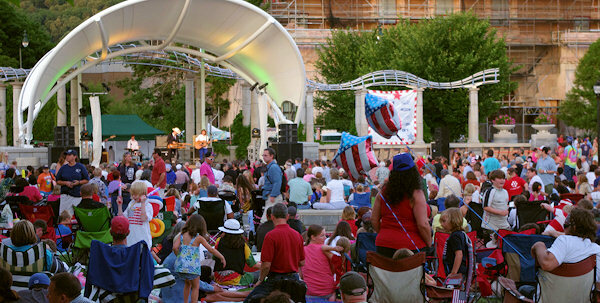 Downtown Asheville Independence Day Celebration 2017: Join in the fun in Park Square Park starting at 2 PM on July 4th at the Ingles Independence Day Celebration. Children's activities and bouncy house 2-6 PM. Splashville Fountain will be on 2-6 PM. Live music starts at 5 PM ending with headliner Mark O'Connor. Ultimate Air Dogs at 2, 4, 6 and 7:30 PM. Beer and wine will be available for purchase. Fireworks at 9:30 PM can be best seen from the park (buildings will block the view in other parts of downtown). Bring your chair or blanket to picnic. Buy from food trucks or nearby restaurants. Parking is available in nearby parking decks, on the street or in private lots. No outside alcohol, coolers or pets in the park. Bryson City: Freedom Fest is an old-fashioned Fourth of July celebration and street festival (10 AM-10 PM) in downtown Bryson City with a 5K, crafts, food, contests, live music, watermelon eating race and the best fireworks show in the Smokies. Also, go rafting or tubing nearby! Read much more on their website. Bryson City: Freedom Train on the Great Smoky Mountains Railroad, July 4th excursion at 7:30 PM, returning to the Freedom Fest for the fireworks show. See our Great Smoky Mountains Railroad Guide. Sylva: Enjoy live music and and dancing 4-9:30 PM, followed by fireworks at dark in the picturesque "all-American" small town nestled in the mountains. Stroll Main Street filled with shops, restaurants and breweries. Go to their Web site. 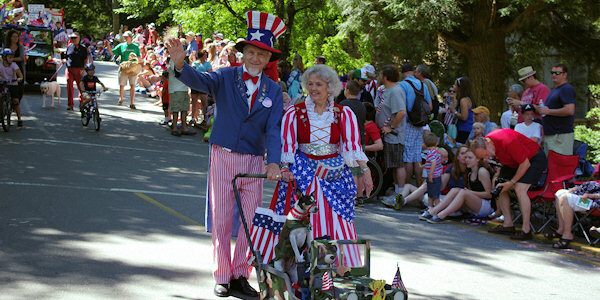 Montreat: Montreat will host a the all Amercian small town parade on July 4 at 10:30 AM (pic above). It's a longtime local favorite. Get there early to see the short-but-fun parade. See photos and video. Lake Glenville: Watch fireworks from land or the lake on July 2nd, located near Cashiers. Rent a pontoon boat at Signal Ridge Marina! Lake Lure: July 3rd is Independence Day festival starting at Noon at Morse Park Meadows near the beach with ice cream, funnel cakes, kettle corn and more - until fireworks at dark over lake with seating at the pavilion. On the 4th, fireworks will be at Rumbling Bald Resort for their owners and guests, but others enjoy from boats on the lake. Expect traffic bottlenecks after fireworks! Banner Elk: Iconic small-town parade begins at 11 AM on the 4th, starting at Lees-McRae College at ending at the town park with lunch vendors, rubber duck race and lawn games at 1 PM. Part of Mile High 4th Weekend, June 30-July 4 with neighboring Beech Mtn. Other events include Art on the Greene, live music and theatre." Go to their Web site. Beech Mountain: Fireworks on July 1 following their annual roasting of the hog that starts at 6 PM. Events all day including scenic chairlift rides, wine tasting, Blues on the Beech, biking, blues and jazz. Part of Mile High 4th Weekend, June 30-July 4. Go to their Web site. Robbinsville: Graham County Heritage Festival on June 30-July 1, 2017 on the square with crafters, food, moonshiners, country and bluegrass music, exhibits, contests on Friday 5-10:30 PM and Saturday 10 AM-11 PM. On Saturday, parade at 1 PM and fireworks 9 PM. Cashiers: Fireworks On the Green with festival, food, music and dancing 6:30-10 PM. Ends with big fireworks show. Orchard at Altapass on Blue Ridge Parkway: July 4th, 11:00 AM-4:30 PM, Covered dish picnic open to all. Live music all day is free! Admission for the meal is a dish to share OR $10 per meal. The Orchard provides fresh barbecue, water, iced tea and paper goods. Cherokee: Fireworks at the Acquoni Expo Center on July 2nd at 10 PM. Part of the Pow Wow Weekend! Hendersonville: July 4th Fireworks display at dark, viewable from downtown Hendersonville, with free live outdoor music 7-9 PM downtown at 201 South Main (Visitors Center). Maggie Valley: Backyard Fourth, gates open at 6 PM and fireworks at dark. Free admission. Maggie Valley Festival Grounds. Old Fort: Parade at 4 PM. Morganton: Red, White and Bluegrass Festival on July 1-3, 2017: One of the top bluegrass music festivals in the South with 20+ bands. Camping, food, crafts and more. â€‹Catawba Meadows Park (701 Sanford Dr). Daily admission starts at $25/advance and $30/gate. Four day pass is $60/advance and $75/gate. Go to their Website. Valdese: Celebrating on Friday, June 30, starting with live music at 7 PM. Also, Antique and Classic Car Show, food trucks, beer & wine, kids rides, and fireworks at 9:40. Live music and dancing ends around 11 PM. Located near Morganton and I-40. Cherokee: Pow Wow on June 30-July 2, 2017 with authentic Indian dancing, drumming and tribal regalia. Fireworks July 1st. Read more about Cherokee Pow Wow. Tryon International Equestrian Center: Saturday Night Lights on July 1st. Watch international level riders compete in horse jumping at this world-class campus with multiple arenas, stadium, restaurants, shops and entertainment. Free admission. Read more about Saturday Night Lights. Antique Car Show in Asheville on June 30-July 1, 2017 with 18 acres of classic cars, trucks and street rods at the Western North Carolina Agriculture Center near the Asheville Airport. $5/person. Visit their Web site for more.